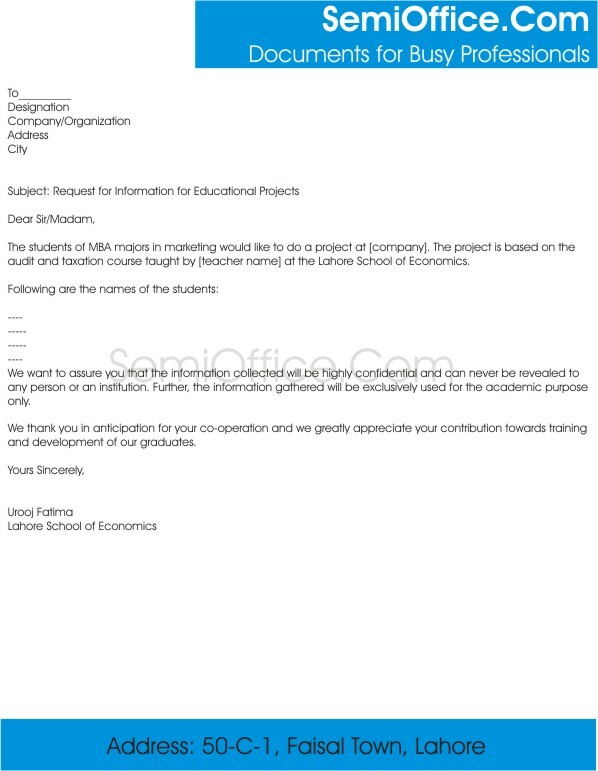 Format of request letter to send to university and asking them about the details of your final project as the project is quite a huge percentage of your grade and completing it on time is another huge task. The students of MBA majors in marketing would like to do a project at [company]. The project is based on the audit and taxation course taught by [teacher name] at the Lahore School of Economics. We want to assure you that the information collected will be highly confidential and can never be revealed to any person or any institution. Further, the information gathered will be exclusively used for the academic purpose only. We thank you in anticipation for your co-operation and we greatly appreciate your contribution towards training and development of our graduates. My name is Fatima Aamir and I am a third year student studying Actuarial Science at Faculty of Science. For building a strong profile for post graduation and getting a good job, I need to be participating in as many projects and internships as I can. Furthermore, my degree requires practical knowledge too along with a good academic profile so I think I should start taking part in major projects. I request you to kindly send me the list of upcoming projects on my email address so I do not miss the ones which are linked to my major and will benefit me the most. In addition to this, I assure you that the extracurricular activates will not affect my GPA and my main focus would still be on my studies. Previous Previous post: What is the Subject in Salary Increment Letter?